Robert Cox Selected as Best of the Bar for Private Firm, Medium Size - Glassman, Wyatt, Tuttle, and Cox, P. C.
Glassman, Wyatt, Tuttle & Cox, PC Partner Robert Cox was awarded the Best of the Bar Award for 2018 by Memphis Magazine in the Medium Sized Private Firm Division. Cox regularly handles some of the firm’s most serious cases involving transportation injury, premises liability, business litigation, professional liability and more. You can read more about the 2018 Best of Memphis Bar Award ceremony by clicking HERE. 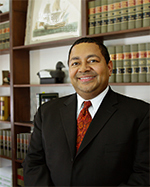 Robert Cox is a trial lawyer that leaves no stone unturned when helping his clients. Robert’s commitment to his clients goes beyond his passion and dedication during the litigation process. Not only does he help educate his clients on each step of a particular matter and evaluate the matter using his over 25 years of experience, he stands ready to go into the field whenever needed to give his clients the upper hand. Robert’s commitment may range from on the scene accident observation and investigation, to wearing work boots in many environments, to appearing before a jury to argue on behalf of his clients.